The number of people forcibly displaced from their homes by violence increased by 90 per cent in 2018 compared to the previous year, according to new findings by the International Committee of the Red Cross. Whereas in 2017, 14,594 people fled their homes, the following year’s figure was 27,780. The Red Cross says that affected communities are in regions where the peace process has not been properly implemented and where armed groups are highly active, such as Chocó, Antioquia, Catatumbo and Nariño. ‘The reality is that in Colombia you cannot talk about post-conflict: currently, there is not one but at least five armed conflicts in the country. 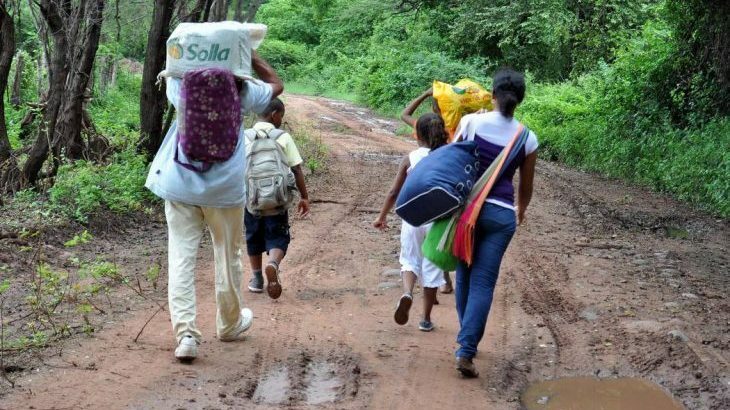 These armed conflicts, added to the violence exerted by groups of different nature in the countryside and in the cities, continue affecting of millions of Colombians day to day’, said Christoph Harnisch, head of the International Committee of the Red Cross. The situation is worst in regions where the FARC’s reformation as a political party has produced a power vacuum that the state has failed to fill. This has seen armed groups enter these regions and compete to take control of illicit economies such as drugs trafficking and illegal mining. The Red Cross also found that in 2018 the number of landmine victims virtually tripled to 221 people, a 287 per cent increase on the previous year. Additionally, there have been cases of forced disappearance every four days since the peace agreement was signed in November 2016. In social terms, a large part of the population still lives in deplorable conditions without access to healthcare and in precariously overcrowded areas. The report said that resolving these crises would require the joint effort of the Colombian state, armed groups and civil society. This appears to be a remote possibility.